Hungarian studio Neocore Games just announced the delay of Warhammer 40K Inquisitor – Martyr, the Action RPG set in the Warhammer 40K universe. The game was previously set to launch on May 11th, but it’s now been postponed to June 5th to apply the latest fixes and polish. 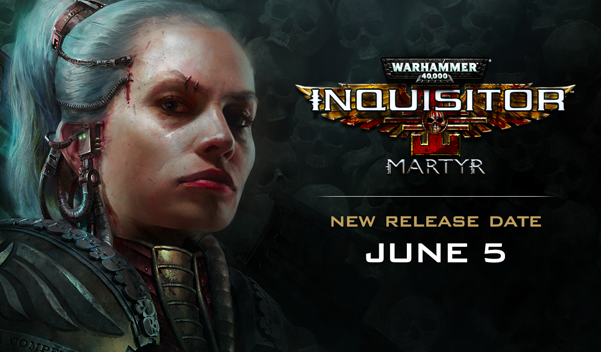 Warhammer 40K Inquisitor – Martyr will launch for PC, PlayStation 4 and Xbox One. However, PC gamers can already access a non-final build of the game via Steam Early Access; a new Steam build will be available on May 25th, though. We interviewed Neocore’s PR Manager Gergo Vas in early February, in case you missed it. Neocore Games is a game studio based in Budapest whose expertise in Action-RPGs has previously been demonstrated, both on PC and consoles, with the title “The Incredible Adventures of Van Helsing”. The team has been working on Warhammer 40,000: Inquisitor – Martyr for 3 years. It’s the very first Action-RPG set in the Warhammer 40,000 universe. Warhammer 40,000: Inquisitor – Martyr lets players control an Inquisitor in the Caligari Sector, a region infested with heretics, mutants, and Chaos Daemons. The game, playable in solo, in local up to 2 players and online cooperative mode with up to 4 players, lets players progress through a persistent universe via numerous missions with varied objectives. The player embodies one of three classes with complementary abilities, each one offering specific skills and varied customisable options: the Assassin, the Crusader and the Psyker. They’ll fight across destructible environments which use a cover system that is unique in this type of game, and must survive battles that are both tactical and brutal.